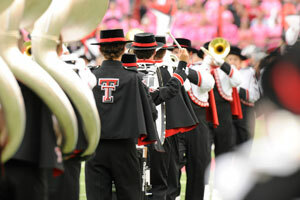 The Goin' Band from Raiderland is one of several bands that make up the program at Texas Tech. Half a century ago 18-year-old Keith Bearden, a recent graduate of Hale Center High School, put on his uniform, picked up his trumpet and marched into the stadium for the first time as a member of the Goin' Band from Raiderland. 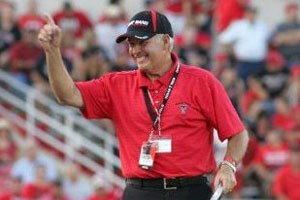 In 2003, after more than 20 years as director of the Texas Tech marching band, when Bearden climbed off the ladder for the last time, Hill was his drum major. In 2015, 90 years after the first time the Goin' Band took the field, Hill is on the ladder, the sixth director of the greatest band in the land. Bearden is in the stands, watching with pride the band he directed for a quarter of its existence. Once or twice this season he may borrow the baton from Hill, an exchange Hill is happy to make. In 1934 D.O. “Prof” Wiley took over, establishing the service organization chapters of Kappa Kappa Psi and the founding chapter of Tau Beta Sigma. 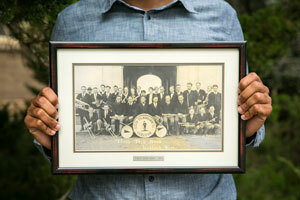 Texas Tech's Alpha Omicron chapter of Kappa Kappa Psi, a band fraternity, celebrated its 77th anniversary this year, while band sorority Tau Beta Sigma came about in the early 1940s as an increasing number of women went to college and joined the band. Several women at Texas Tech actually led the charge to get the sorority recognized as a sister organization to Kappa Kappa Psi and helped other Texas institutions open chapters. After a 25-year run, Dean Killion replaced Wiley, known as the Father of Texas bands. Bearden, who marched under Killion, said popular marching styles changed through the decades. During Killion's directorship bands moved from the military-style marching of the 1950s to the precision drills like creating shapes in the 1960s to Drum Corps International free-form shows of the 1970s. Killion's legacy was in the precision drills, his successor said. Bearden, director from 1981 to 2003, returns every year to direct a few practice drills and occasionally directs the big-time performances. By the time he arrived, high school bands were improving so much he could hear a noticeable difference in the quality of the music from week to week. In 1999, under Bearden's direction, the John Philip Sousa Foundation awarded the Sudler Trophy, the highest honor for collegiate marching bands, to the Goin' Band. He also saw lifelong friendships arise, romances blossom and future generations of Goin' Band members don the uniform. Both of his sons have gone through the band and his granddaughter, a freshman who plays the French horn, started this year. Christopher Anderson, who is the director of fine arts at the Lubbock Independent School District, was director from 2003 to 2009, and Hill, who came back to Texas Tech for his master's degree after several years of teaching, holds the baton today. When Anderson left, Hill was given a trial period of sorts and showed himself to be a good fit for the job. Director of bands Sarah McKoin came to Texas Tech a decade ago, and she remembered how excited everyone was for the 80th anniversary. Now that the 90th has rolled around, they wanted to have some fun. It starts with a traditions halftime show at the Texas Tech vs. TCU football game on Saturday with the band planning drills from the Killion, Bearden and Anderson eras. Since many alumni return for football games, particularly this one, they decided to make it a weekend to celebrate band tradition. On Friday night, the wind ensemble and symphonic band will do a concert with Anderson and 2009 alumna Tamey Anglley, now a professor at Stephen F. Austin University, conducting. 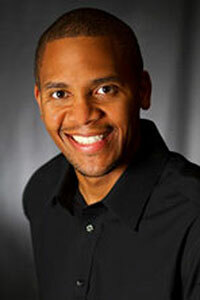 Guest soloist Andy Smith of the Chicago Lyric Opera, a tuba player, graduated in 2010. 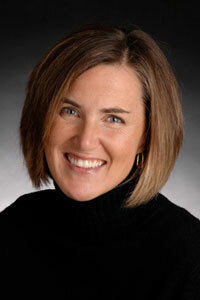 “There's a lot of tradition that goes all the way back to Dean Killion,” she said. The Goin' Band memberships consists of about a quarter music majors, while the rest are music enthusiasts majoring in just about every major Texas Tech offers. The university has five concert bands, two jazz bands and a pep band in addition to the marching band; most of those students are music majors. McKoin said the program has grown significantly through the years as the Goin' Band and its directors have marched Texas Tech into the national spotlight. It is a different experience than can be found anywhere else. “They're good. They're really good,” McKoin said. “I think they're entertaining. I went to Michigan State for my undergraduate and did my doctorate at UT, and those are great bands, too, and have great traditions, but there's just something about Lubbock – I noticed it when came and interviewed – it is a big deal. I can't put my finger on it, but the Goin' Band's impact on campus culture, on instrumental music education and performance in Texas is unparalleled. Both McKoin and Hill, though they are enjoying the 90th anniversary, also are looking forward to the century mark in 10 years. The Goin' Band From Raiderland is the 450-member marching band of Texas Tech University and is under the direction of Duane Hill. 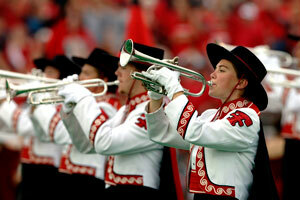 The Goin' Band is part of the School of Music in the College of Visual & Performing Arts at Texas Tech University.